My friend moved recently to a new home, which was a real fixer-upper. She’s been working like crazy over there and I’ve been getting over there to help her every chance I get. Today’s post is not the big reveal yet (I can’t wait for that!) but I do want to share some of our DIY wall art projects. Before I show you how we made the wall art above, you have to see this cool wall art she already had. My friend is a true beach lover. We are both Jersey shore girls (I don’t mean like the girls from the MTV show), having both grown up within walking distance of the nearest beach. 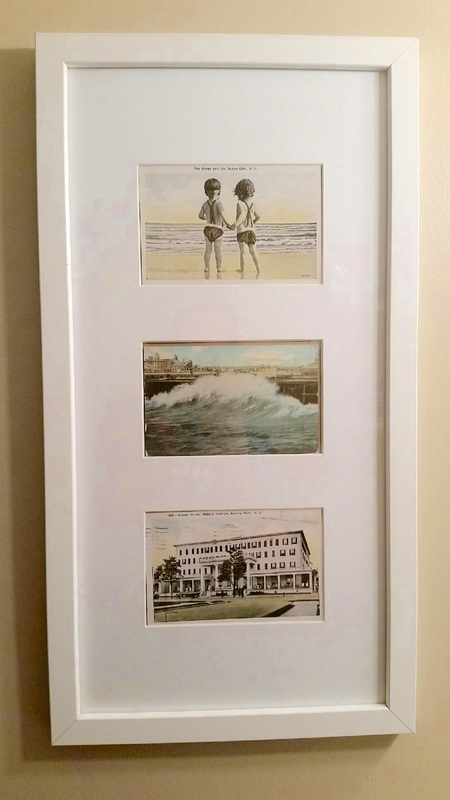 While we were hanging all her wall decor Sunday, she brought out these framed vintage post cards. She got them from her aunt who found them in her local community center. Her aunt tried for weeks to find their rightful owner, with no luck. She eventually gave them to my friend. 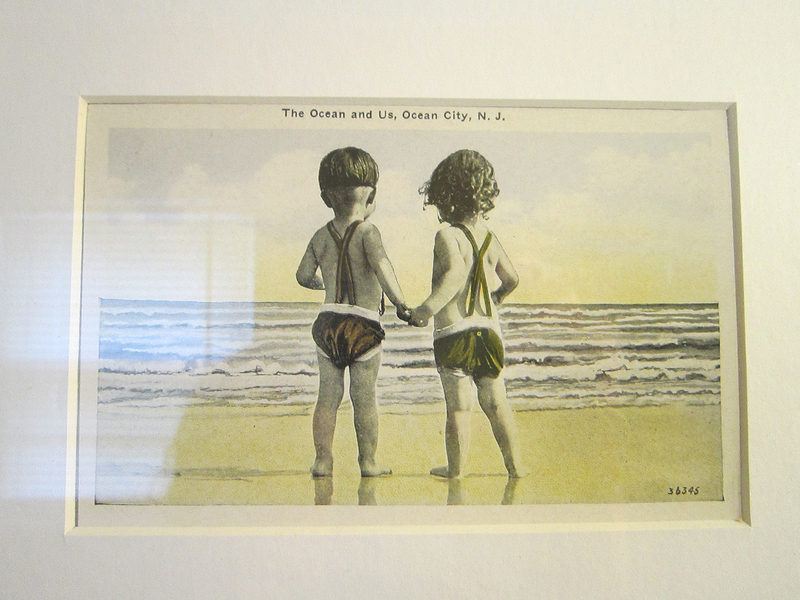 Each postcard is from a different Jersey shore town. The top is Ocean City, the center is Atlantic City and the bottom is Asbury Park. 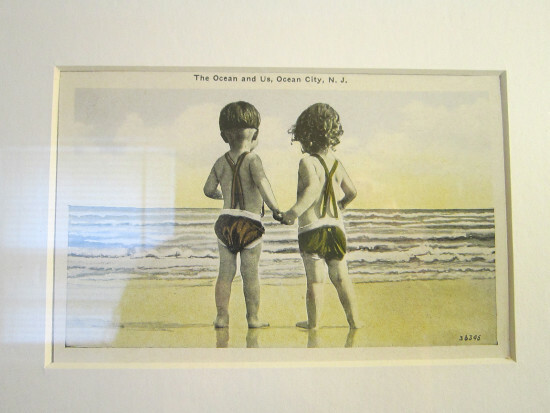 These are actual postcards that were sent in the 1920s. Here is a close up of the Ocean City card. My friend took the frame apart to show me the backs. The one from Asbury Park reads “Greetings from Asbury Park”. Ironic for any Bruce Springsteen fans! 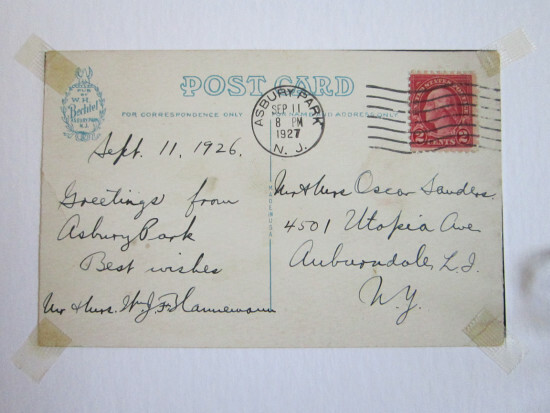 The date stamped is Sept. 11, 1927. And the stamp cost two cents! Such history in these cards! 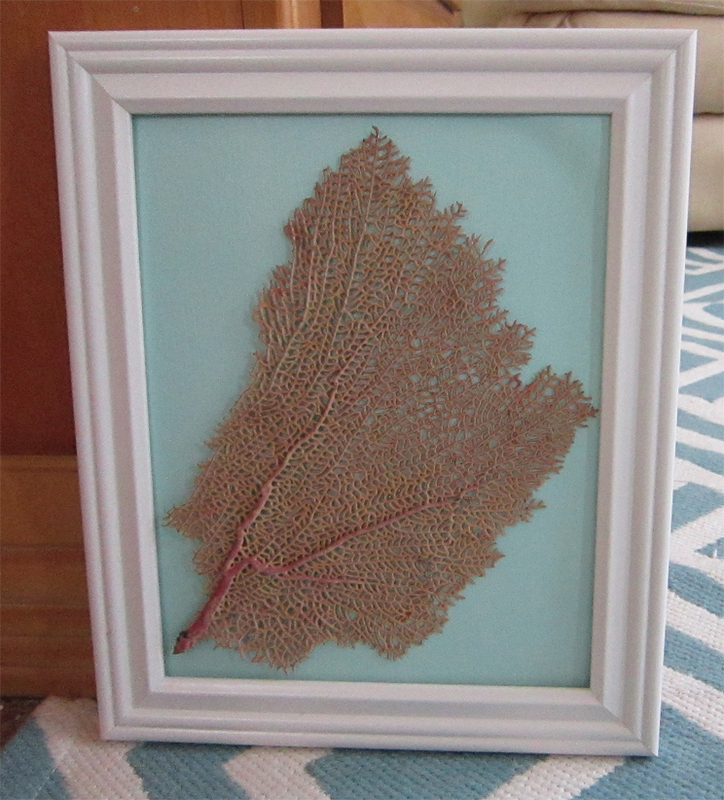 As for our sea fan wall art, this was an easy DIY. 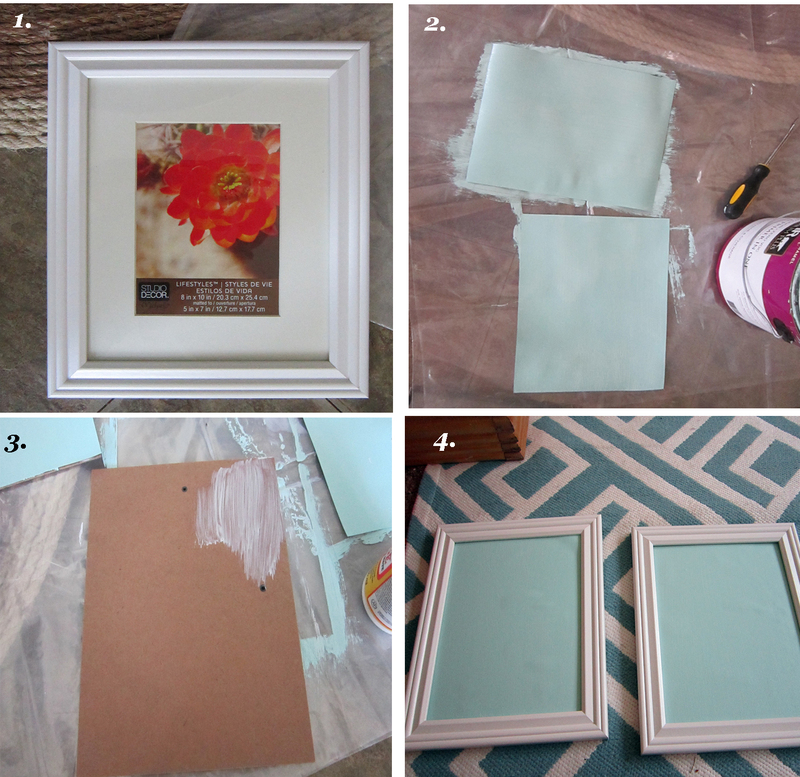 We started with a regular frame and painted the paper backing blue. I Mod Podged the cardboard insert and attached the blue paper to it. I re-assembled the frame and glued the sea fans to the blue paper. 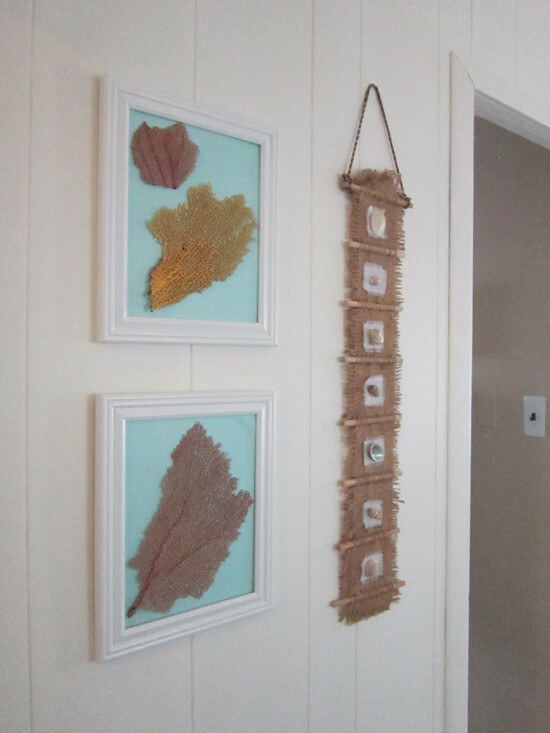 I had ordered these sea fans from eBay a while back to use in my family room and still had some leftover. Then we made a little wall display. The piece on the right she already had. 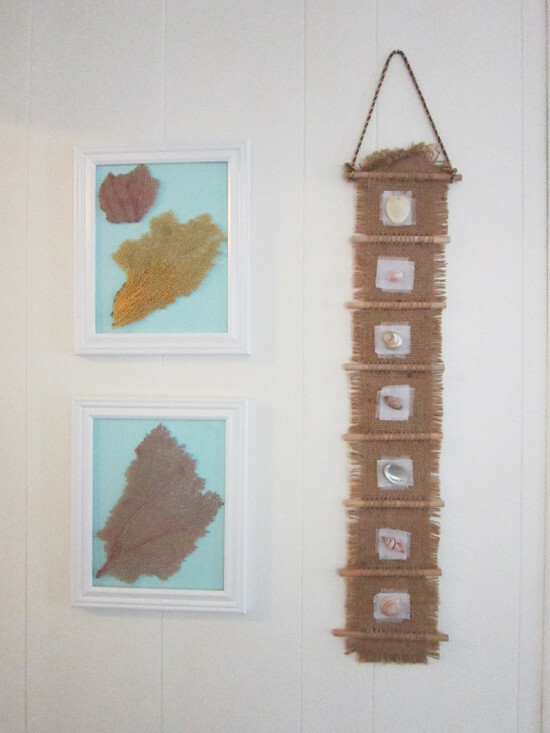 I love how the texture of the burlap complements the texture of the sea fans. Pottery Barn sells similar sea fan wall art for $79 each! Ours were well under $20 each. 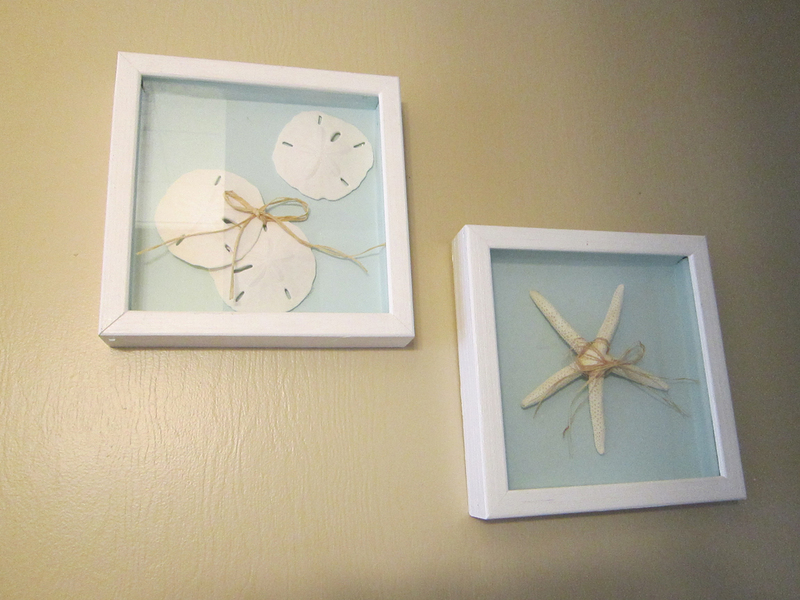 Two other pieces I had to share (even though this photo didn’t come out good) are these beachy shadow boxes she made. 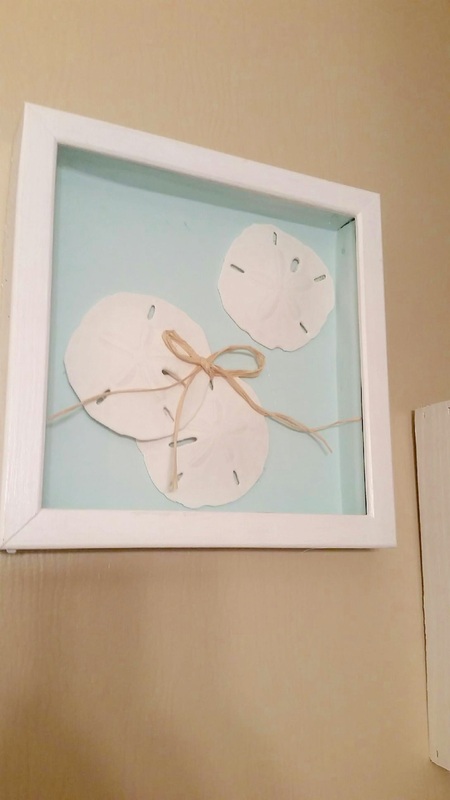 The sand dollars are from a a beach in Florida she visited. She used blue craft paper as the backing and added a little bit of raffia. So cute! We have a few more projects to complete before her place is ready for the final after photos, but I can tell you the change is dramatic! You don’t want to miss this one! SO pretty! LOVE that blue background!!! So cute! We are redoing our pool house (which is just a tiny changing room off our garage). I love so many of you ideas for that project! I love nautical home decor themes. You can’t go wrong with that blue hue! Love those vintage postcards by the way. Thanks, Tee. The vintage postcards are really cool! 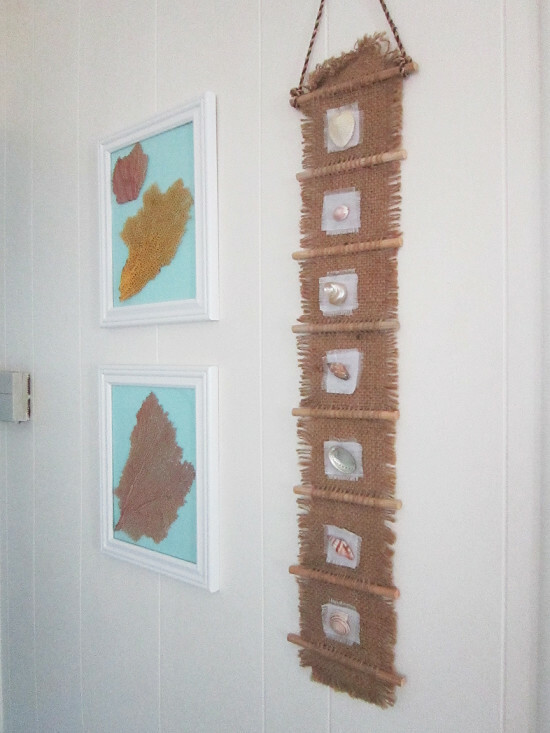 What a fun way to display seashells! I never know what to do with ones I find at the beach and want to keep. 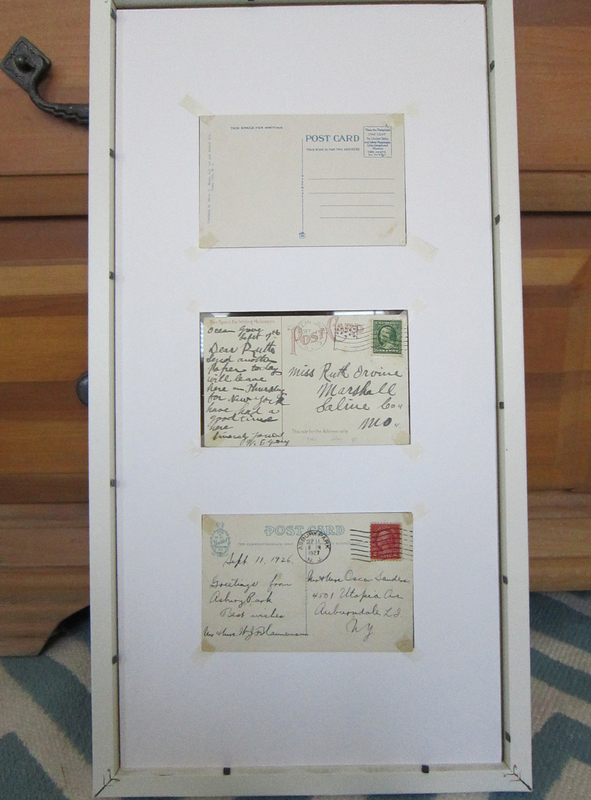 Love the color blue in the backing and what fun postcards! Thanks for sharing this at TALENTED TUESDAY link party!